Whether for business or personal use, a truck, bus or RV is a significant investment. The best way to protect that investment is with regular maintenance from a team that knows your vehicle and can identify and stop potential problems before they start. For over 65 years, our reputation for quality has been unsurpassed – we are committed to providing truck and school bus service for North Carolina businesses. With help from our team of experts, you can lower your cost of ownership, run your fleet more efficiently and get more use out of each of your vehicles. Contact the location near you for truck service that helps keep you running for the long haul. Gregory Poole Truck Centers are committed to providing you the highest quality of products and services for your truck, bus, trailer or RV. We fully understand and appreciate that your future success depends on the availability of your equipment. Our goal is to help you minimize equipment downtime and reduce operating expenses. Our overall objective is to provide you with timely and quality service. We encourage you to contact us for all your future needs. We have the very best certified technicians, and product support personnel in the business, guaranteed! Air Conditioning Service and Repair – We are a Mobile Climate Control (MCC) authorized service center. Our technicians are certified to handle Freon in a safe and environmentally friendly manner. We’ll keep you cool even when the heat is on. 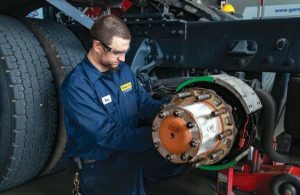 Brake Services – Our technicians receive factory level brake system training and have DOT certifications to ensure your drum or disc braking system operates at peak efficiency. Alignment – Using the latest Hunter Alignment technology, we can align a wide range of vehicles from full-size pickup trucks to dump trucks and road tractors extending the life of your tires and saving you money. Clutch Services – Whether a 10 speed or 18 speed transmission, our experienced and knowledgeable technicians can diagnose and repair your clutch and manual transmission problems. We can service, rebuild or replace your transmission on-site – all at a reasonable cost. Radiator Services – We can us inspect, pressurize and maintain your radiator. 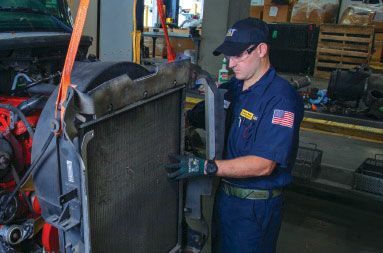 If a replacement radiator is needed, we can install a new or remanufactured radiator to keep your cooling system operating at peak performance levels and get you back on the road. Transmissions and Differentials – Our Allison certified technicians use the latest Allison software to diagnose and repair leaks, electrical and shifting issues. We are also trained to diagnose and rebuild a wide range of Eaton RTO/RTLO transmissions as well as select Eaton, Spicer and Meritor differentials. Engine Repair – From minor tune-ups to major overhauls, we have the training and equipment to service Caterpillar, Blue Bird, Ford and other major vehicle manufactures. Our sophisticated diagnostic test equipment allows us to accurately diagnose engine issues and confirm performance following repairs. Our commitment to providing the best truck and RV / motor-home service in North Carolina has led us to invest in the highest quality equipment and the most knowledgeable staff in order to serve you better and faster. From the smallest repair to the biggest, our team is dedicated to getting you back on the road with service you can count on. All the way from a fleet to a single owner we can customize a service plan to fit your needs. Our service is backed by 100% parts and labor warranty on all Caterpillar and NAPA installed parts at any Caterpillar dealer in U.S. Pride matters to us and we take pride in YOUR ride.